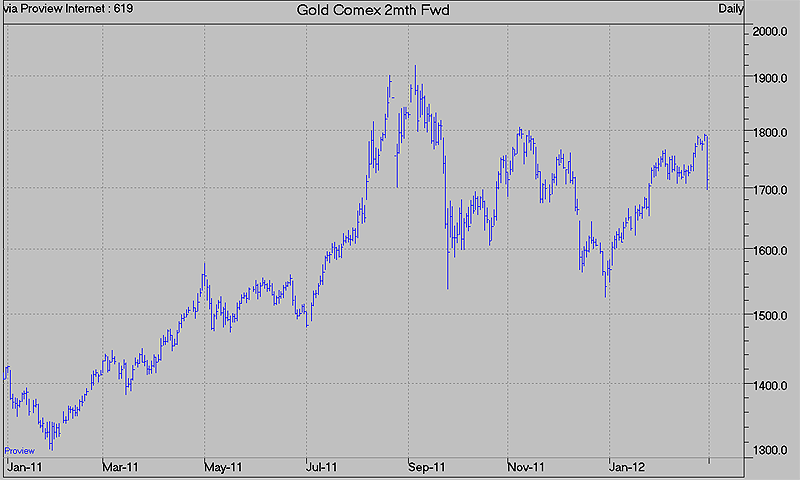 What happened to gold on 29 February 2012? 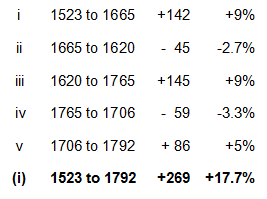 The precious metal dropped from $1792 to a low of $1686 in one day! How does this shape up with our Elliott Wave expectations? Regular wave 1 will consist of 5 minor waves which we label (i) (ii) (iii) (iv) and (v). Waves (ii) and (iv) will be downward corrective waves one degree small than the regular waves. Thus they should be about half the magnitude of the 13% of the regular sized declines, say about 6%. Minor wave (i) should consist of five minuette waves which we can label i ii iii iv and v. Again the minuette waves ii and iv will be downward corrective waves about half the size of the minor wave corrections of 6%. Thus the minuette corrections should be approximately 3%. The two corrective waves are approximately 3% as expected. Waves i and iii are equal at 9% while wave v is almost exactly 61.8% of waves i and iii. This wave count is as perfect as one could wish for. Thus we can conclude that minor wave (i) was completed at $1792. As described above, minor wave (ii) should be a correction of approximately 6%, but could range from 5% to 8%. A decline of 6% from the $1792 peak gives a target of $1685. In after hours trading yesterday gold reached $1686. The COMEX chart, however, shows a low point of $1696. It is possible that the entire correction in minor wave (ii) occurred in one day. A rally followed by a further decline to test the $1685 area is a more likely outcome. An 8% decline would bring the $1650 area into play. If gold drops below this level we will have to consider other possibilities. Once the bottom of minor wave (ii) is in place in a convincing fashion it will be possible to make some more accurate longer term gold price forecasts.